There is no more addictive snack than this simple do-it-yourself mix of healthy, hearty foods. 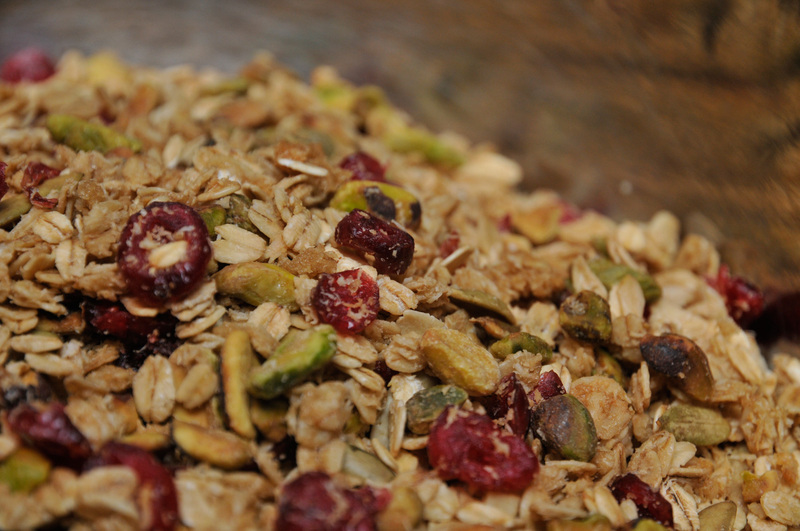 Granola can be so much better than the stuff you buy at the store. This makes a lovely hostess gift, yogurt-topper, between-meal munchie… the list goes on. Credit for this recipe goes to the Manhattan restaurant Eleven Madison Park, where chef Daniel Humm sends guests off with a half pound of this granola as a parting gift. The recipe was published in the May 2012 issue of Food Network Magazine. I’ve made a couple of minor modifications to my own taste. 1. Preheat oven to 300°F. Toss the oats, coconut, pistachios, pumpkin seeds, and salt in a large bowl to combine. 2. Gently heat the brown sugar, syrup, and olive oil in a small saucepan on the stove, stirring until the sugar is dissolved. Pour over the oat mixture and stir until evenly coated. 3. Distribute the mixture in an even layer on 1 or 2 baking sheets. (I line my baking sheets with parchment, which makes cleanup easier.) Bake the granola in the oven for 20-25 minutes, stirring occasionally to allow for even cooking. This entry was posted in Breakfast, Desserts, Snacks, Vegan, Vegetarian and tagged Breakfast, Nuts, Snacks by Baron. Bookmark the permalink. I just made a note to myself yesterday to find a great snack recipe for a long plane ride — and this is perfect! Thank you! Hey Julie! Happy to help enhance your traveling experience! Hope all’s well with you.